Something happened then. A page of 123greetings.com flashed on the screen followed by a few splashes showing me an animation of scanning through the system folders of my computer. After that, the following XP style window appeared on my Leopard desktop and forced me to download two PC executable files with randomized filename. The active web page has been redirected to scanner2.malware-scan.com. 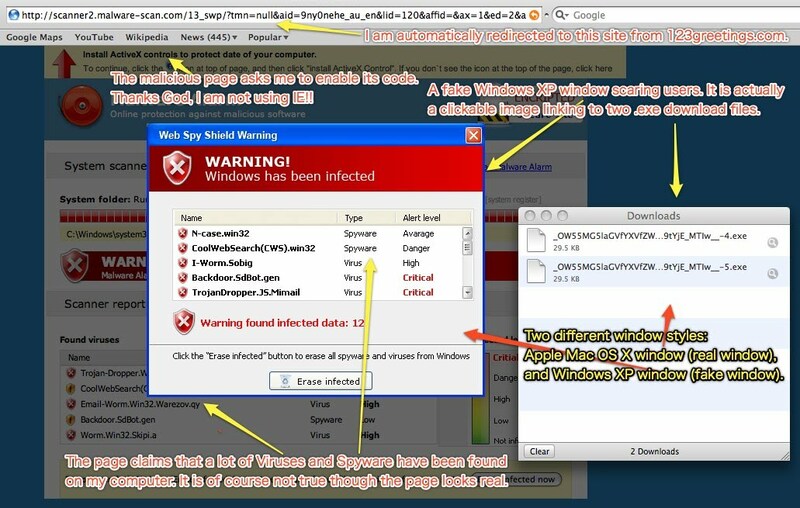 As I illustrated in the screenshot above, it was a malware attack. 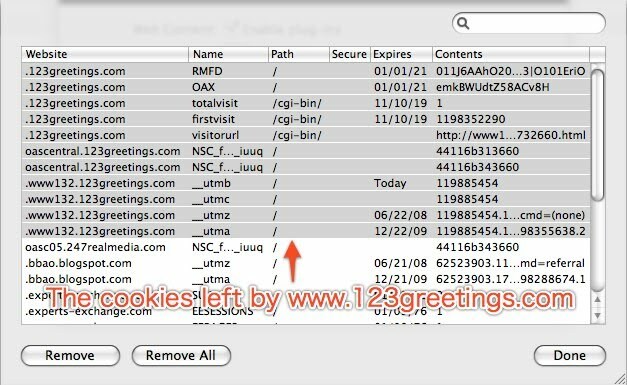 As for Cookies, only 123greetings.com left several items in Safari's Cookie records, as shown below. malware-scan.com didn't leave its trace. The downloaded executable files were identical except their filenames. I ran one file in a disconnected Windows 2000 Server box (a virtual machine), the file's process appeared in Task Manager. It seemed nothing happened (of course it's not ture). I ran the executable several times, several individual processes appeared in Task Manager, as follows. I enabled the network connection on the W2K virtual machine. After a while, a "professional" anti-spyware program, MalwareAlarm 2.1, appeared on the screen, and has already started scanning the system. This bloody scanner reported that I had nine threats, and asked me to buy online in order to activate its Threats Removel function. TCPView showed that this program (MalwareAlarm.exe) was downloaded from 69.50.175.18. There was a business behind this anti-spyware spyware. It even showed me such a screen. Futhermore, I did a google search for this, and found that someone already reported the a similar spyware two days ago, on 21 December 2007. Thanx for the warning and excellent clarification of this hazard. I've encountered the same (and luckily Firefox did a proper job). Valuable very touchable information. I would like to thank you for sharing your great facts. Due to the recent change of Google Page Creator, all images that previously hosted at googlepages.com have been migrated to Google Sites at sites.google.com. As a result, some early posts of this blog site cannot show the images directly. However, you may simply click those blank images to view the migrated copies in full size. All the affected images will be moved to Picasa Web Albums in the near future. Sorry for any inconvenience it may cause. What is the biggest security threat this year? Why I do NOT use Baidu, never! The text, images, graphics, audio, video, animation, and their relevant files and design on this blog website are all subject to copyright and other intellectual property protection. These objects (unless otherwise noted and excluding messages posted) are copyright © by Bing Bao, the owner of bbao.blogspot.com. These objects may not be copied, translated, distributed or modified in any manner (electronic, web or printed) without the prior written consent of the owner. The only exception to this rule is linking to articles with a maximum of 20 words or paraphrase copied per article. The information on this blog website is provided "as is" and without warranty of any kind, expressed or implied, including (but not limited to) any implied warranties of accuracy, effectiveness for any particular purpose, or non-infringement of third party rights. While the information provided is believed to be accurate, it may include errors or inaccuracies. In no event shall bbao.blogspot.com be liable to any person or organisation for any direct, indirect or consequential impacts relating to this material. Copyright © 2006-2010 Bing Bao. All rights reserved.